It was 10:40 by the time we left Columbus. The sky was cloudless in Columbus, but puffy clouds started accumulating in great heaps as we headed east; they were lovely to view, but we were glad it didn't rain. There were construction barriers much of the way, but it was Sunday, so there was no actual work going on, and no delays. The land gets hillier as you leave Ohio and move into Pennsylvania, and the trees get bigger and denser; there was enough fall color to make it interesting. 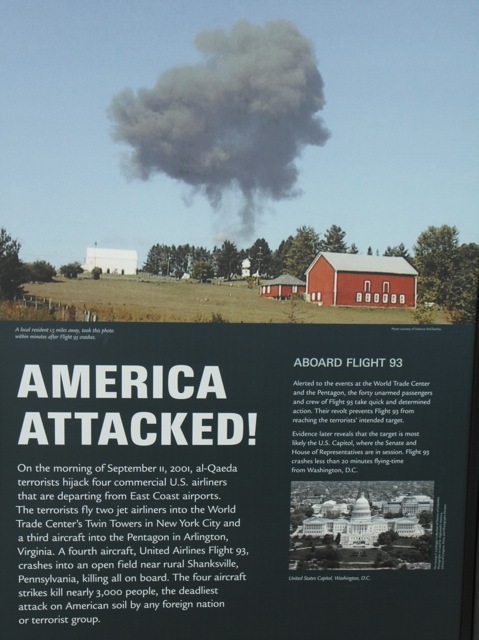 We drove straight to Somerset without stopping for lunch because we wanted to have time to visit the Flight 93 National Memorial. We checked into our Quality Inn motel about 3:00 p.m.
A local resident took this photo. 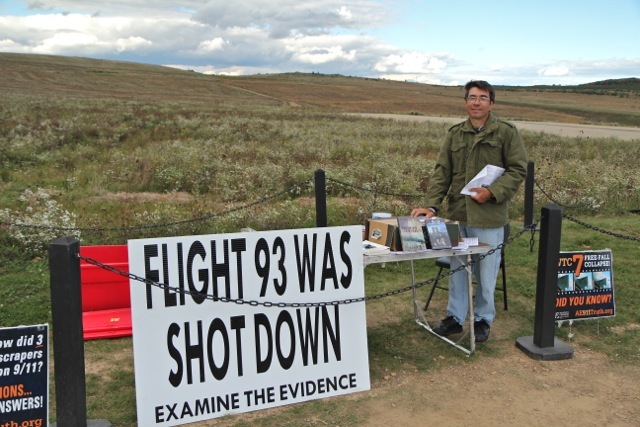 On September 11, 2001, United Airlines Flight 93 crashed in an unused field in a former coal mining area about 14 miles from Somerset. The route there took us through some interesting rural areas that are not really getting much use. They've devoted a rather large area to the memorial site; they are still developing it. 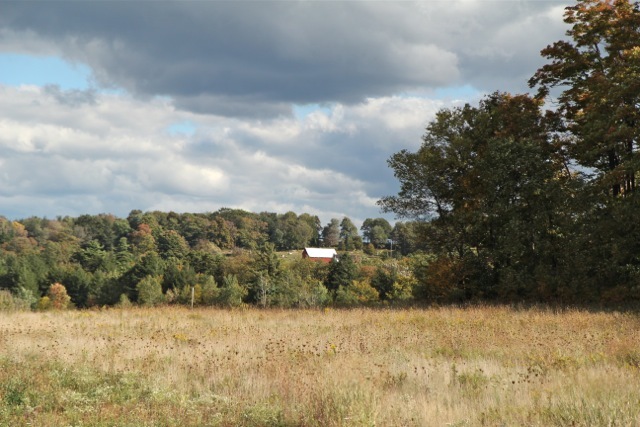 They are attempting to restore the wildflowers and grasses that were native to the area before the coal mining and they have planted a long allée of trees. 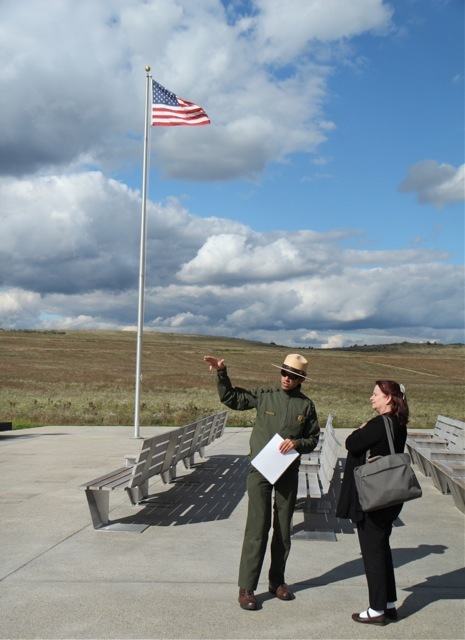 There is an outdoor visitors' center with photos of the passengers who perished and information about the crash, and several park rangers are eager to give you the details. 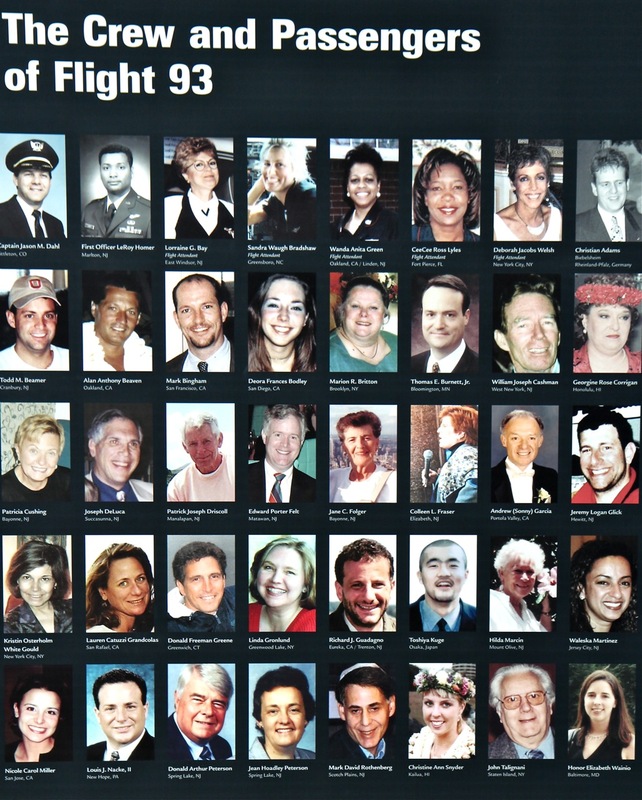 The outdoor Visitor Center has these nice photos of the victims/heroes. 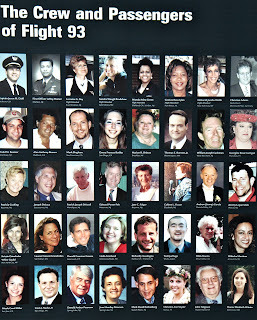 At first the terrorists cowed the passengers (it was a small flight: passengers and crew totaled 40), forced them to the rear or the plane, and took over the cockpit, but the passengers sort of organized themselves. They notified their families by cell phone and airplane phone. From them they got the news of the attack in New York, so they realized their terrorists wanted to do something similar. Some of them decided to try to regain control and entered the cockpit. In the midst of the scuffle, the terrorists decided to ditch the plane. It went straight down at 585 mph, creating quite a crater. The crater is shown in photos but cannot be viewed. Who can say how many lives they saved by their sacrifice. 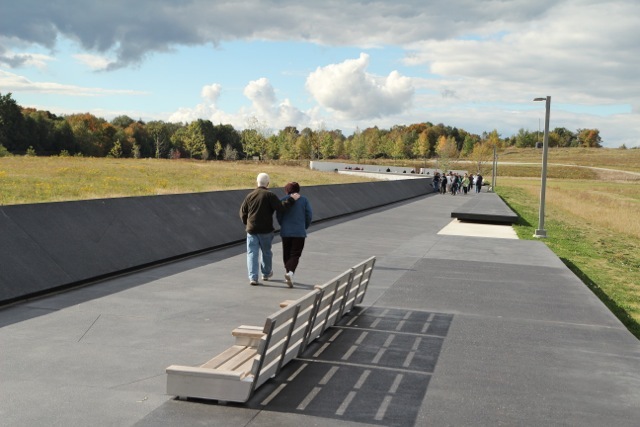 Getting out to the memorial itself requires a longish walk; the evening was very chilly. 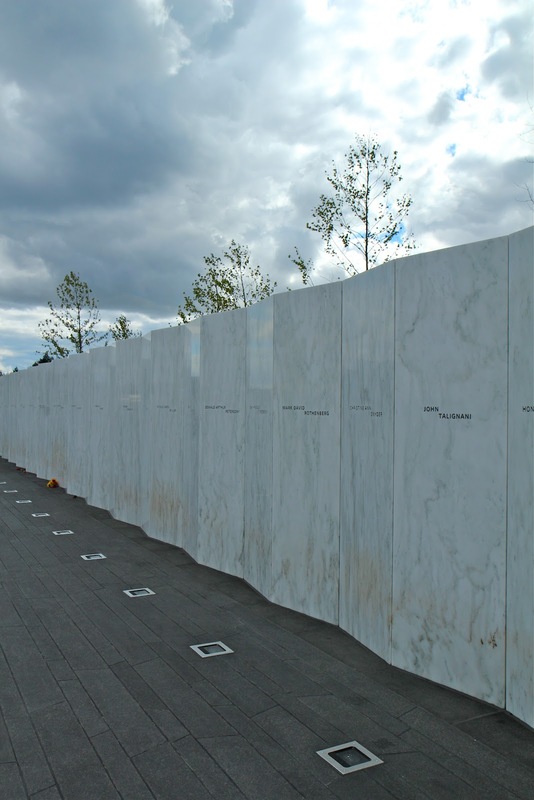 The memorial consists of tall marble slabs, one for each victim/hero. It was a chilly walk, but we had our warm jackets. 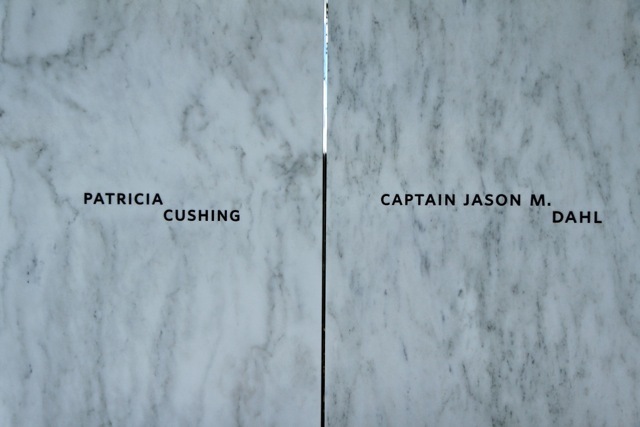 A marble slab for each one who perished in Flight 93. Dan picked up his brochures and read them later. A sun break shows the beauty of the setting. Having skipped lunch, we stopped for dinner on the way back to the motel at about 5 p.m. We chose the Pine Grill because it was handy, but it turned out to be an excellent place. Dan had chicken breast piccata and I had meatloaf without gravy. Good food; good service.